After a tumultuous opening, we were reminded of last week, when Tim Westybrook was claiming to be able to beat anyone in the locker room. Harrison Hash stood up for everyone, and Westybrook left. But not before shoving Hash! The two veterans battled 1 on 1 tonight for the first time in almost 20 months! It was as open and even as they come, and either man could have won it. 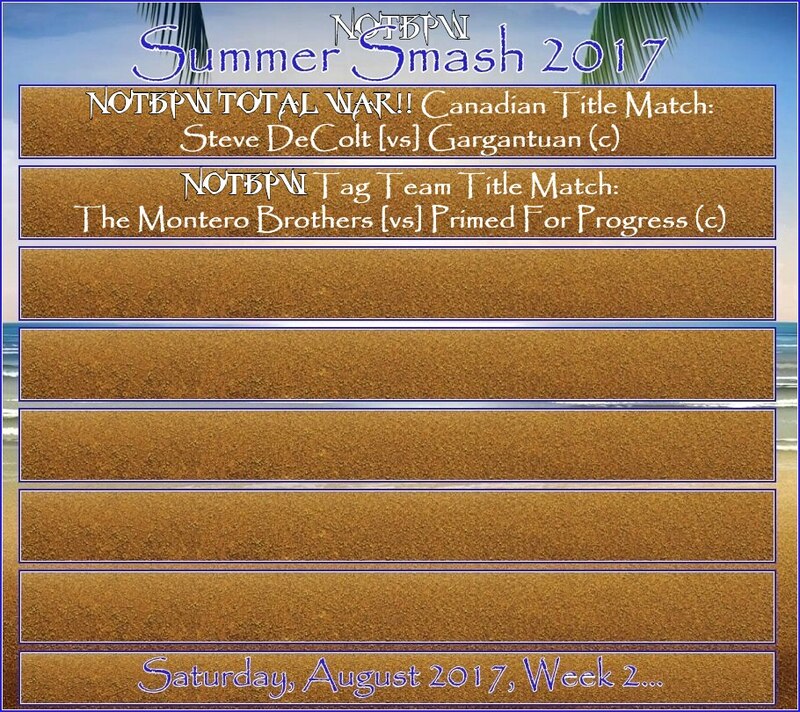 In the end though, Hash attempted two clotheslines, and as he hit the ropes for the third time, Westybrook hit his 'TNT Whirlwind' finisher! POISON made his triumphant return to action last week, winning his first match in over a year. He then went on to attack 'Awesome' Wade Orson, leaving the Brit down and out backstage. Orson isn't here tonight, but POISON had another challenge ahead of him. Derek Frost has had a rough few weeks, and he looked like he'd carried the weight of those few weeks with him into this match. POISON won it comfortably in the end, locking 'The Ice Man' in his 'Antidote Web' finisher! This match was a tale of two halves. For the first half, Sonny Wildside was in complete control, and he was even able to take down Ernest Youngman and Dean Waldorf. He didn't do enough damage to Marv Statler though, and it was his distraction that allowed Sean Deeley to take over for the second half of the match. 'The Shooter' was then able to lock Wildside in his 'Front Choke Lock' and the youngster tapped out! As is often the modus operandi of 'The Shooters', Sean Deeley ordered his troops to circle the ring and get a man on each side... He shouted at them that it was time to make an example of Sonny Wildside, and force the 'Man Without Fear' to finally fear someone... But Wildside has made some valuable friends during his tenure on the main roster... None more so than Solomon Gold and The Natural – The American Blondes!! But they weren't the only ones to run out to make the save... They were joined by an unlikely ally!! Ricky Dale Johnson returned to the announce desk next... making his entrance to his music, and to huge cheers from the fans... He was slow on his walk to the ring, and still feeling the effects of the attack from Edd Stone earlier in the show... Tom Townsend and Peter Michaels asked RDJ what happened earlier... and what he thought Edd Stone's problem with him was... RDJ had no idea... and the show looked like it was going to continue... But out of nowhere, Edd arrived from behind the announced desk, and he slapped Johnson around the back of the head!! Edd Stone's arrival sparked pure anger from Ricky Dale Johnson, and he wanted to rip Stone's hair out!! But 'The Animal' sloped away, and before RDJ knew it, Stone was 10 rows back into the crowd!! Peter Michaels and Tom Townsend tried to calm RDJ down but he was having none of it... He stormed up the ramp shouting that he was going to see Alex DeColt right now!! Michaels and Townsend theorised that RDJ would be asking Alex for a match with Stone... But will Alex allow the veteran to lace up his boots one more time...?! It's been a tough few months for Lord James King, so he needed a win here tonight. He's tried to make life difficult for Wade Orson, but the Brit has overcome everything 'The Gentleman' has thrown at him. King was in there tonight against a match skill-wise in Mark Griffin. King has a lot more charisma though, and he used his experience edge to his advantage. He knocked Griffin out with his 'Power of the Punch' finisher, using his patented Brass Knuckles behind the referee's back! 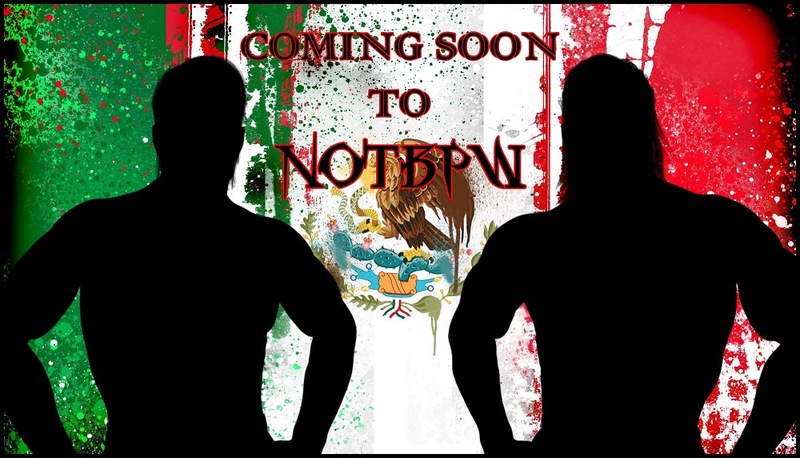 Next up we took a look at the promo we've been seeing for weeks about a debuting Mexican Tag Team coming soon to NOTBPW... The video was mostly the same... talking about how much pedigree they have as a tag team... and how much experience... 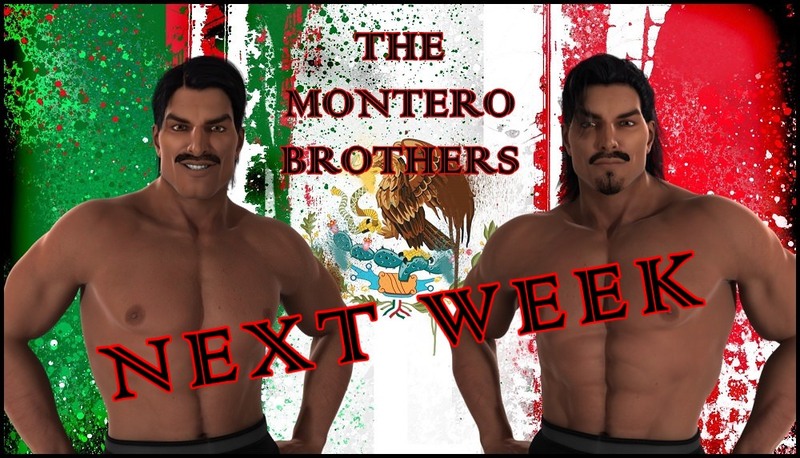 However, this video package had a huge difference to it... Because at the end of this video package, we learnt the identity of the two Mexican Megastars...!! If Danny Cavanagh could somehow pick up a win here, he'll get what he wants the most in this life, and replace James Hernandez in next weeks match against 'The Monster' Gargantuan. But Hernandez wants an opportunity to test his skills in there against Gargantuan too. 'Mainstream' feels that his 'streak' gives him an advantage that Gargantuan's previous countless opponents haven't had: confidence! He used that confidence to dance around Cavanagh, and not let the big man get hold of him for long. In the end, Hernandez hit his 'Apparition #14' finisher and he put big Cav away comfortably! At that moment, in walked 'The Wild Man' Jack DeColt... and he had some questions of his own... He asked Alex DeColt what the hell was going on... He said he thought no one would ever find out the truth... But Alex told him to stop talking right now, because there are cameras everywhere!! Eyes... ears... and constantly people talking... Alex said that they should meet tonight... in private... and discuss things together... Jack didn't know what to make of it all, but it seems he knows the 'secret' that Dan DaLay has been promising to reveal... But what could it be...?! As mystery opponents, this one was a bit of a disappointment, but Akima Brave gave a good showing of himself when it was all said and done. The big Samoan went after Steve DeColt early on, and took him by surprise. But 'The Outsider' isn't a former 7-time World Champion for no reason. He soon came back into it and found himself in control of the contest. Akima Brave didn't have an answer for any of DeColt's strong offence. He walked onto a DDT, and was then hit with a brutal lariat. To win the match though, it took Steve DeColt's 'DeColt Stampede' finisher and a strong cover!! USPW's roster continues to grow, as they've completed the signing of Danny Fonzarelli... He'll be pushed as an Upper Mid Carder, and will compete under the name: 'Jay Darkness'...!! !